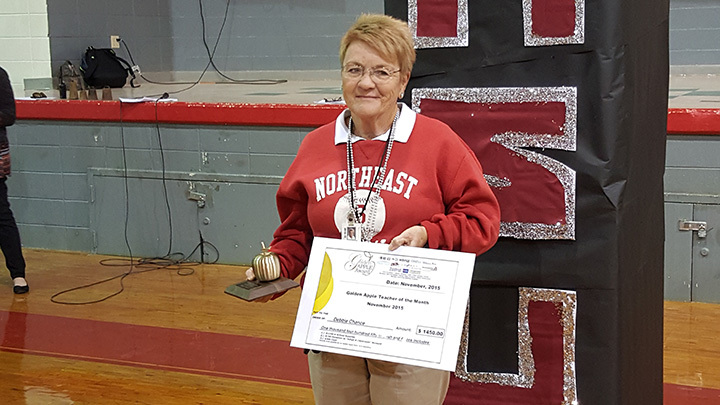 When Debbie Chance started teaching 38 years ago, she never dreamed she would retire as an award-winning educator. 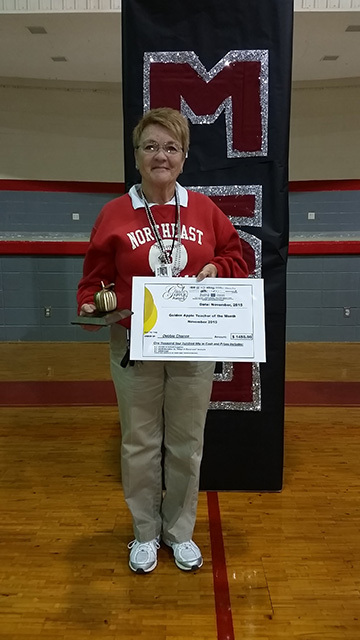 But because of her dedication to the profession she loves, Chance, a physical education teacher at Northeast Lauderdale Middle School, was presented with the Golden Apple Teacher of the Month award Monday. 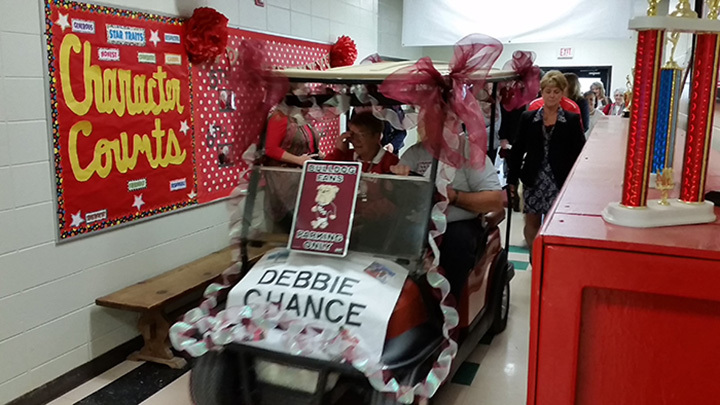 It was an emotional day for Chance, as a gymnasium full of well-wishers cheered as she was escorted into the gym in a golf cart decorated in Mississippi State colors. "I am in total shock," Chance said. 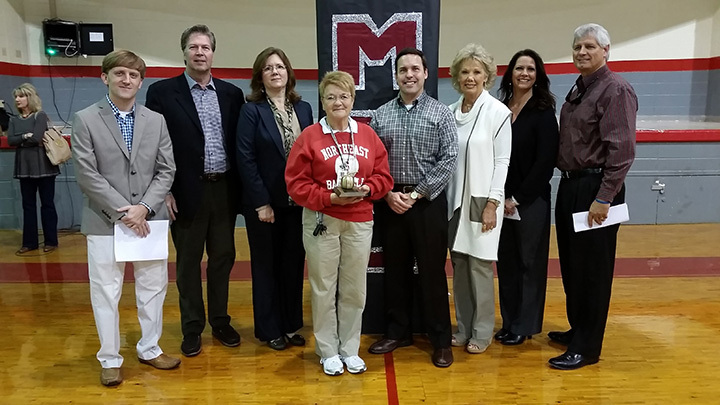 "I've kept up with the winners through the years, and it has always gone to teachers who teach academics. For people to care enough to put forth the effort to pull something like this off for you, I am just humbled by it." As a Golden Apple winner, Chance will receive a $300 cash prize, a Golden Apple Trophy, a $150 donation to their "Adopt a Classroom' account and a large school supply donation for their classroom. Chance, along with seven other Golden Apple Teacher of the Month winners, will be invited to the Golden Apple Teacher of the Year banquet and that winner will again receive $2,500 cash to be used at their discretion and a $2,500 scholarship to be awarded to a deserving student in the teacher's name. Growing up, Chance always loved sports. But when she went to college at Mississippi State University, she was told there wasn't a course offered in physical education for women, only men. "One of my professors told me to get a couple of other girls who wanted to get a degree in P.E. and go talk to the right people," Chance said. "We did and the very next year they opened up a P.E. department for girls. I was the first female president of their Majors Club." After nearly four decades of teaching, Chance has seen many changes in the field. 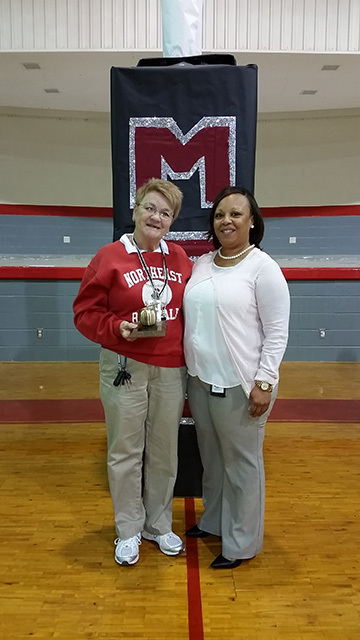 "Students are much more athletic than they were back when I started teaching," she said. "We have better facilities, better supplies, and more opportunity to help our children in the classroom." Her advice for new teachers? Forget what you learn in books. "The learning starts the minute you have that class by yourself," Chance said. "You are going to have to find that you have to do the things that work for you, and your class. Be organized, and be fair." Chance hopes her students remember her as being a fair person. "I want them to remember that I was strict, but not to the point that I was harsh," Chance said. "I want them to remember that we had a good time, that we learned more than the rules of a ball game in my class. "We learned how to work together as a team, we learned the importance of cooperating, and the importance of communicating.If they have learned those three things from me, and can carry that out of my class and into the world, or the next classroom, then I think they will know they learned a lot more in my class, than just playing games." The veteran educator said she will miss her colleagues at the school, who have become like a family to her. "We have always taken care of each other, I am blessed," Chance said. "I will miss them and I guess from time to time I will have to bake a cake and sneak it in the lounge for them. 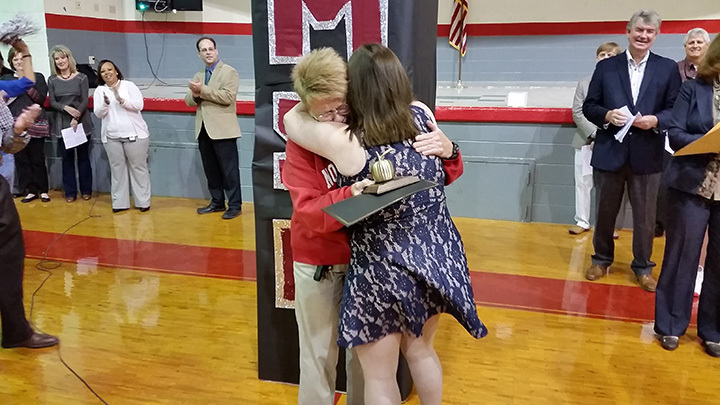 "Receiving the Golden Apple award means a lot to Chance, she said, because she plans to retire at the end of the school year. "I have 107 days left and I'm looking forward to it," she said. "You just know when it's time to go. Will I do something else? Yeah, if God opens a door for me, I am going to be receptive." 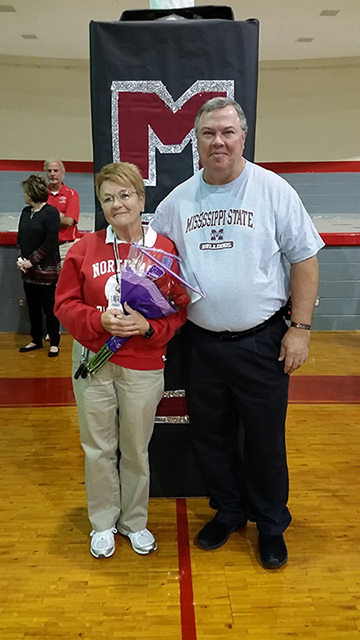 Tim Moore, the principal at Northeast Lauderdale Middle School, said Chance is like an institution, having taught at the school for more than 25 years. 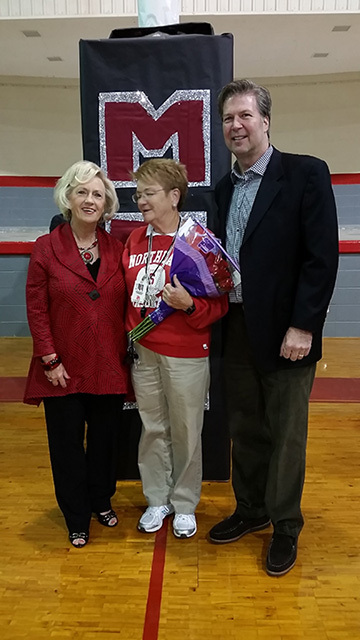 "She's always been there for our children, for whatever they need, whether it be academic or from the physical end," Moore said. "She is just a sweetheart, one of those ladies that anything you need done she is willing to do. 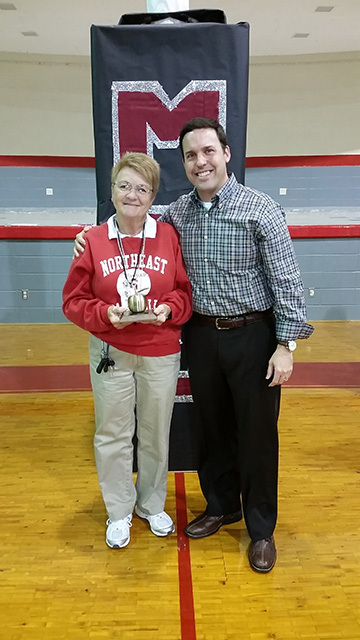 She teaches P.E., but teaches so much more." Chance's daughter Cassie Gage said she was amazed to know the impact her mom has had on her students. "Growing up, you don't appreciate having a single mother that works a full-time job to support two kids," Gage said. "Now working in education, and understanding some of the perils that teachers face, it amazes me what she was able to do. So many people I graduated with tell me that my mom had an impact on their lives." One of Chance's former students is Melissa Labelle, the head of the school's parent teacher organization. Chances also teaches Labelle's children. "She just wants to leave with her students knowing that they were disciplined, she was fair, and they had fun." Labelle said. "That was her theory 25 years ago when I was here, and she has been true to that. I've watched her go to the hospital and take the sick children and their families whatever they needed, I've watched her bake cakes and bring them to school, just because. She is always donating to whatever cause is going on, she just gives of herself. She is tough, but she also has that big soft heart." "Ms. Chance makes P.E. not just a fun time, but a time we can all get together," said eighth grader Daneeo Konnar. "She makes it a class, but also a time where we can socialize and just enjoy ourselves, not just hard work. She has influenced me, and inspired me. She taught us that if you work hard you can accomplish the goals you want to achieve." 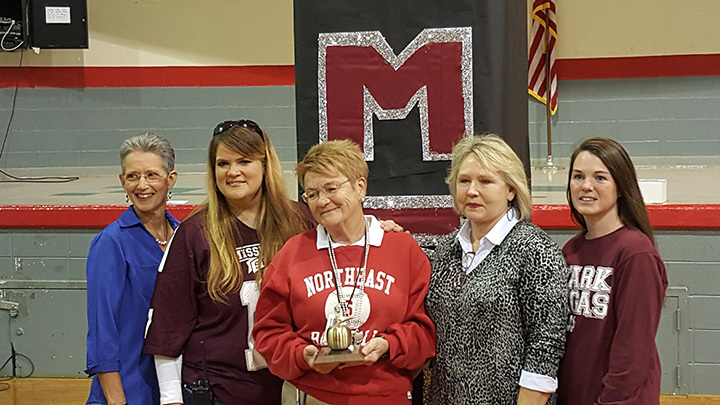 The Golden Apple Award is open to any educator, grades kindergarten through 12th grade who works in the following: Lauderdale, Neshoba, Kemper, Clarke, and Newton counties in Mississippi, or Choctaw and Sumter counties in Alabama.